A few weeks ago, I was driving through the shopping center at the corner of Main and Drake in Oshtemo Township when I noticed a sign hanging from the storefront that used to be B’Wiched Deli. Of course I had to go check it out to see what was moving. 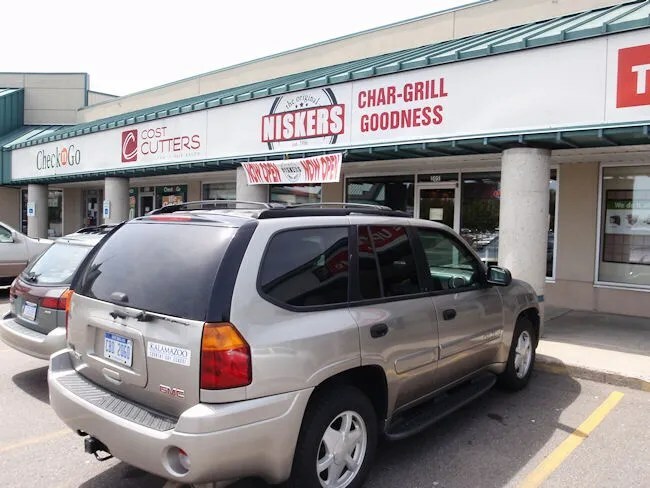 I’m sure I would have found out sooner or later, but I’m really glad I drove down to see what the new place was….because what I found was a sign for the new Niskers Char-Grill. 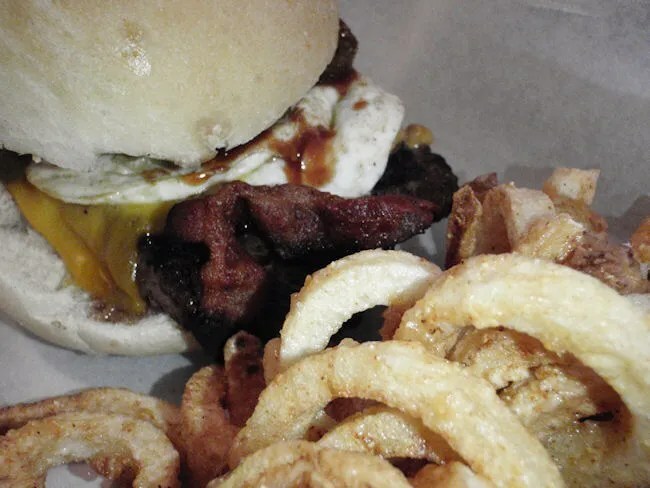 It’s only been open a few weeks now, but Niskers Char-Grill has already hit their stride as a fantastic burger joint. They’ve completely remodeled the space adding wood paneling to the walls and adding more of an industrial feel to the dining area. The restaurant is set up the same was as the old Niskers locations. There’s a cash register at the head of the order counter where you place the order. After that, you head down to the toppings area where you pick which of the toppings you want on the bun. 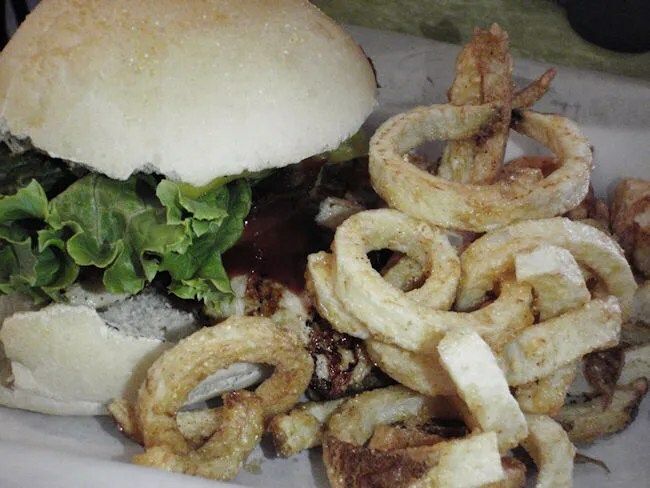 When ordering a burger, you have the option of just ordering the burger plain and piling on toppings or you can choose from one of their creations and work your way up from there. I was leaning towards just ordering the burger, but J pointed out the Sunny Sider which came with a fried egg, bacon, and cheddar cheese. I opted to get that with steak then added on jalapenos and BBQ sauce. When I ordered, I assumed the steak would be ground into a patty, but that was not the case. It was a small slice of surprisingly tender steak cooked to a perfect medium with just a hint of pink in the middle. J and I were joking about oversleeping and missing breakfast, but I had my breakfast in sandwich form. It was a perfect replacement for Steak and Eggs. The fried egg, cheddar cheese, and bacon were delicious and the jalapenos added just a little bit of heat. The BBQ sauce held everything together and added a little bit of a sweetness to the sandwich. J ordered the Hawaiian with a chicken breast instead of a burger. She also swapped out the Honey Teriyaki for Sweet Lou’s BBQ sauce. The sandwich also comes with grilled pineapple and bacon. She added on lettuce, banana peppers and a little more BBQ sauce. The thing that J really noticed about her sandwich was the bun. We had the same bun, but I guess I ate too fast to notice, but she said the bottom part of the bun was more like bagel with a hole in the bottom. She said the chicken was delicious and really liked her sandwich. We both rounded out our meals with battered fries and a Coke. The fries are fresh cut curly fries that are battered and deep fried. The sandwiches are served in a metal pan and the fries fill out the empty spaces leaving the a plate that is almost overflowing. Thanks for the great review. I just recently noticed this had opened and was curious what it was all about. I’ll definitely be checking out a burger very soon.